A little something Lynn Sosnoskie shared with us... real weeds in artificial/fake turf. What changes in weed species are we seeing after four years of drought? 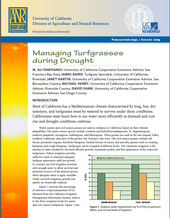 Do weed populations change during a drought? Does drought favor certain species? Does annual or perennial species matter? During this four year period of drought in California, have they changed? What are the populations of annual and perennial weeds? With a limiting growth factor, in this case water, weeds become more prominent and which of them will or could disappear? In urban landscapes, where turf grass areas are being renovated, or in non-irrigated land that has been farmed, but furloughed, or in non-cropped roadsides or wasteland, are we seeing life-cycle species shifts? Or is it that we see a loss or decreased competitiveness of annual species, thus perennial species can be observed? Don't let your lawn die!